Finally a blog on my hometown – Visakhapatnam, or Vizag as it was often called, is the best tourism destination in Andhra Pradesh. From Lakes to cool Beaches, from beautiful Hill Ranges to Caves and Valleys, Visakhapatnam has them all. The district has many tourism spots that represent the Culture and Heritage of the true India. Ramakrishna Beach, popularly known as RK beach, is the closest beach park you can reach from the heart of the city. 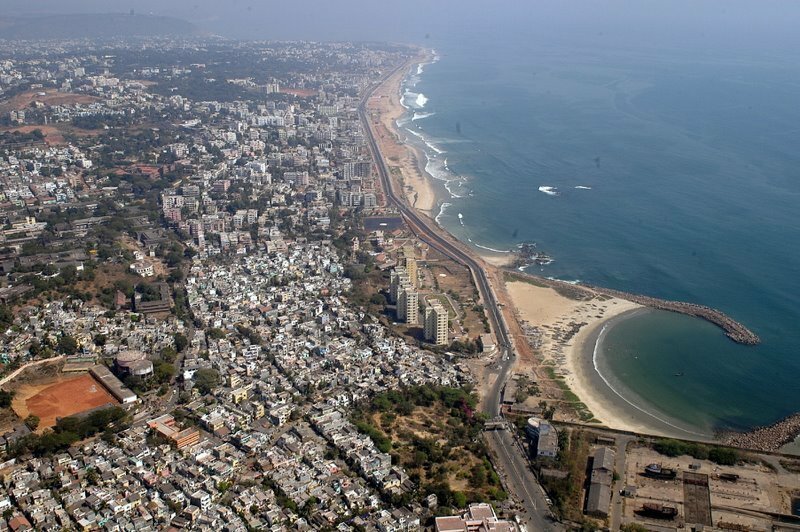 Of course, the beach is one of the best tourist spots in Vizag . Spreading through the edge of the sea, the R.K.Beach is a great spot to spend time with your loved ones. Singles of course always get mesmerized in their dreams sitting at the beach shores. People from around the world come here to enjoy the cool breeze. Young Children spend their Sunday and Holiday evenings here playing with sand. Tucked away between the hills, away from the maddening cacophony of the city, lies Vizag Beach – Yarada, a pristine, safe and enchanting beach, hidden just behind the ‘Dolphin’s Nose’ hill. The waters here are shallow making it ideal for kids and adults alike to frolic in the waters… An excellent choice for beach getaways. The old natural route to Vizag Beach Yarada combines elements of adventure, trekking and a ferry ride. The ferry ride is across the port channel which leads to a narrow pathway snaking upward, amidst lush green of Dolphin Hill. Bheemili beach is located near Bheemunipatnam, which was the second municipality in Indian mainland. Unlike RK beach or Rishikonda beach, you don’t find much people here all the time. So if you want to find peace or solace, there is always Bheemili beach. Just a few kilo meters from the outskirts of Vizag, I went to this beach many times and had a pleasant time with my friends. Thotlakonda buddhist complex is situated atop a hill on your way to Bheemli. There are buddhist remains there and view of the thotlakonda beach can be seen. A hill on the sea coast with salubrious climate was an ideal attraction for the Buddhist monks to build a monastery complex here. Big place with full of rock-cut cisterns hewn into the bedrock. Located at a distance of 114 km from the city of Visakhapatnam, this valley in the Eastern Ghats is a heaven to all the creative guys as well. Standing a witness to many cameras, Araku has been an ideal platform for many photographers. There are even many travel films made on this beauty that will steal your heart. Borra Caves are one million year-old limestone caves and the deepest caves in the country. Situated in Anantagiri hills of Andhra Pradesh, the caves are situated at an altitude of 1400 m and occupy an area of 2 sq.km. Borra Caves is one of the best places to visit in Araku Valley. It is also one of the top weekend getaways from Vizag. Simhachalam is a small village in the southern Indian state of Andhra Pradesh. The village lies very close to the city of Vishakhapatnam (Vizag). The place is very popular among the devotees of Lord Vishnu who throng the village in large numbers every year. Simhachalam has one of the eighteen shrines dedicated to Lord Narasimha, a half-man, half-lion incarnation of Lord Vishnu. The temple priests make it a point to keep the idol of Lord Narasimha covered with paste prepared from sandalwood. One can only guess the age of the temple, but an inscription on the temple dates it back to at least 1098 AD, the times of the Chola King Kuloththunga. Another inscription points to the Kalinga queen who lived between 1137 and 1156 AD. In fact, there are more than 252 inscriptions on the walls of the temple. All these inscriptions only point to the antiquity of the temple and have gained a lot of historical significance in contemporary times because they help archeologists string together the major historical events. The inscriptions on the walls of the temple are in Telugu and Oriya, and the architecture of the temple is also reminiscent of the architectural style of the two regions. Gangadhara, a holy bathing tank is also found on the hillock. Apart from the adventurous trekking and camping activities that it offers, Lambasingi can also be quite the place for many to embrace their solitude on its unperturbed, fog-covered roads. You can even make some treasured memories with your loved ones as you lie down on the vast grass beds and gaze into the infinite night sky filled with glittery constellations. We can’t find a better place to visit along with our companions. Be it an adventurous road trip, getaway from Visakhapatnam along with our friends or a sweet journey in a van along with our family, this picturesque village is sure to give you a truckload of happy memories. Well! !.That’s all about my hometown vizag ,hope you enjoyed reading a round-up of Vizag Holidays. Keep following for more refreshing stories from there. PS: Whenever you are in Vizag and are looking for some sweets and savories, do ask for Laddu Gopal Sweets shop and pick some delighting stuff and check in to Raju gari dhaba near Rushikonda for conteinental cuisine.